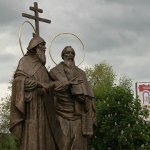 Saints Cyril and Methodius Day is celebrated as a public holiday in the Czech Republic and Slovakia because they are considered co-patron saints of these countries. The commemoration is held on July 5. Saints Cyril and Methodius were the principal Christian missionaries among the Slavic peoples in Pannonia and Great Moravia. They are credited with introducing Orthodox Christianity to these areas and influencing the cultural development of all Slavs. They created the oldest known Slavic alphabet, the Glagolitic alphabet, also known as Glagolitsa. Saints Cyril and Methodius were brothers, they were born in Thessalonica, Byzantine Empire (present-day Greece). In 862, they were sent as missionaries to Great Moravia (present-day Slovakia and the Czech Republic) at the request of Prince Rastislav. The people of Great Moravia were originally evangelized by Roman Catholic missionaries, but Rastislav preferred the support of the Byzantine Empire. Even so, nowadays most Czechs and Slovaks identify themselves as Roman Catholics. Currently, the Roman Catholic Church celebrates the feast day of Saints Cyril and Methodius on February 15. However, in Slovakia and the Czech Republic the observance is held on July 5. According to legend, on that day in 862, the two missionaries came to Moravia from the Balkans to propagate literacy and Christian faith.